Palmer Amaranth (Amaranthus palmeri) is a dicot weed in the Amaranthaceae family. In Arkansas this weed first evolved multiple resistance (to 5 herbicide sites of action) in 2016 and infests Cotton, and Soybean. Multiple resistance has evolved to herbicides in the Groups B/2, E/14, G/9, K1/3, and K3/15. These particular biotypes are known to have resistance to acifluorfen-sodium, carfentrazone-ethyl, flumetsulam, fluthiacet-methyl, fomesafen, glyphosate, imazethapyr, lactofen, pendimethalin, pyraflufen-ethyl, pyrithiobac-sodium, S-metolachlor, and trifloxysulfuron-sodium and they may be cross-resistant to other herbicides in the Groups B/2, E/14, G/9, K1/3, and K3/15. Greenhouse trials comparing a known susceptible Palmer Amaranth biotype with this Palmer Amaranth biotype have been used to confirm resistance. For further information on the tests conducted please contact the local weed scientists that provided this information. There is no record of differences in fitness or competitiveness of these resistant biotypes when compared to that of normal susceptible biotypes. If you have any information pertaining to the fitness of multiple resistant Palmer Amaranth from Arkansas please update the database. The Herbicide Resistance Action Committee, The Weed Science Society of America, and weed scientists in Arkansas have been instrumental in providing you this information. Particular thanks is given to Matthew Bertucci, and Nilda R. Burgos for providing detailed information. Singh, S., V. Singh, R. A. Salas-Perez, M. V. Bagavathiannan, A. Lawton-Rauh, and N. Roma-Burgos. 2019. Target-site mutation accumulation among ALS inhibitor-resistant Palmer amaranth. Pest Manag Sci 75 : 1131 - 1139. BACKGROUND: Palmer amaranth (Amaranthus palmeri S. Wats) is one of the most common and troublesome weeds in the USA. Palmer amaranth resistance to acetolactate synthase (ALS) inhibitors is widespread in the USA, as in Arkansas. The cross-resistance patterns and mechanism of resistance are not known. Experiments were conducted to determine cross-resistance to ALS inhibitors and identify target-site mutations in 20 Palmer amaranth localities from 13 counties in Arkansas. RESULTS: All Palmer amaranth localities tested had plants cross-resistant to imazethapyr, flumetsulam, primisulfuron, pyrithiobac and trifloxysulfuron. The dose of trifloxysulfuron that caused 50% control was 21–56-fold greater for resis- tant accessions than for susceptible ones. All but three resistant plants analyzed had one or two relative copies of ALS; one plant had seven relative copies. All resistant plants tested (18 localities) carried the Trp574Leu mutation, which is known to confer broad resistance to ALS inhibitors, supporting the cross-resistance pattern observed. Besides the Trp574Leu mutation, 30% of localities had individuals with one additional resistance-conferring mutation including Ala122Thr, Pro197Ala or Ser653Asn. CONCLUSION: The Trp574Leu mutation in ALS is the primary mechanism of resistance to ALS inhibitors in Palmer amaranth from Arkansas, USA. In some localities, multiple mutations have accumulated in one plant. 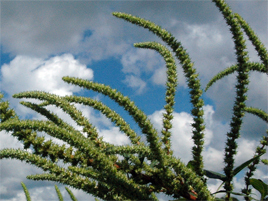 All localities tested contained plants with resistance to five families of ALS inhibitors. Localities with extremely high resistance to ALS inhibitors, and those outside the subset we studied, may harbor non-target site resistance mechanisms. ALS inhibitors are generally no longer effective on Palmer amaranth in these localities from the US mid-south. Larran, A. S., V. E. Palmieri, V. E. Perotti, L. Lieber, D. Tuesca, and H. R. Permingeat. 2017. Target-site resistance to acetolactate synthase (ALS)-inhibiting herbicides in Amaranthus palmeri from Argentina.. Pest Management Science doi:10.1002/ps.4662 : . BACKGROUND Herbicide-resistant weeds are a serious problem worldwide. Recently, two populations of Amaranthus palmeri with suspected cross-resistance to acetolactate synthase (ALS)-inhibiting herbicides (R1 and R2) were found by farmers in two locations in Argentina (Vicuña Mackenna and Totoras, respectively). We conducted studies to confirm and elucidate the mechanism of resistance. RESULTS We performed in vivo dose–response assays, and confirmed that both populations had strong resistance to chlorimuron-ethyl, diclosulam and imazethapyr when compared with a susceptible population (S). In vitro ALS activity inhibition tests only indicated considerable resistance to imazethapyr and chlorimuron-ethyl, indicating that other non-target mechanisms could be involved in diclosulam resistance. Subsequently, molecular analysis of als nucleotide sequences revealed three single base-pair mutations producing substitutions in amino acids previously associated with resistance to ALS inhibitors, A122, W574, and S653. Nakka, S., C. R. Thompson, D. E. Peterson, and M. Jugulam. 2017. Target Site–Based and Non–Target Site Based Resistance to ALS Inhibitors in Palmer Amaranth (Amaranthus palmeri).. Weed Science 65 : 681 - 689. Resistance to acetolactate synthase (ALS)-inhibitor herbicides due to continuous and repeated selection is widespread in many troublesome weed species, including Palmer amaranth, throughout the United States. The objective of this research was to investigate the physiological and molecular basis of resistance to ALS inhibitors in a chlorsulfuron-resistant Palmer amaranth population (KSR). Our results indicate that the KSR population exhibits a high level of resistance to chlorsulfuron compared with two known susceptible populations, MSS and KSS from Mississippi and Kansas, respectively. MSS is highly susceptible to chlorsulfuron, whereas KSS is moderately sensitive. Dose–response analysis revealed that KSR was more than 275-fold more resistant compared with KSS. Nucleotide sequence analysis of the ALS gene from the plants that survived chlorsulfuron treatment revealed the possibility of evolution of both target site–based and non–target site based resistance to ALS inhibitors in the KSR population. The most common mutation (Pro-197-Ser) in the ALS gene associated with resistance to the sulfonylureas in many weed species was found only in 30% of the KSR population. A preliminary malathion study showed that the remaining 70% of resistant plants might have cytochrome P450–mediated non–target site resistance. This is the first report elucidating the mechanism of resistance to ALS inhibitors in Palmer amaranth from Kansas. Presence of both target site– and non–target site based mechanisms of resistance limits the herbicide options to manage Palmer amaranth in cropping systems..
. Weed Science 64 : 312 - 320. Palmer amaranth has greatly disrupted agricultural practices in the United States with its rapid growth and rapid evolution of herbicide resistance. This weed species is now suspected in Argentina. To document whether the suspected plant populations are indeed Palmer amaranth, molecular comparisons to known standards were conducted. Additionally, these same plant populations were screened for possible herbicide resistance to several acetolactate synthase (ALS)-inhibiting herbicides. Sequencing data confirmed that suspected populations (A2, A3, A4) were indeed Palmer amaranth. Another population (A1) was tested to determine whether hybridization had occurred between Palmer amaranth and mucronate amaranth the native amaranth species of the region. Tests confirmed that no hybridization had occurred and that A1 was simply a unique phenotype of mucronate amaranth. Each population was screened for resistance to imazapic, nicosulfuron, and diclosulam. All Palmer amaranth populations from Argentina were shown to be resistant to at least one ALS-inhibiting herbicide. The populations were then subjected to further testing to identify the mutation responsible for the observed ALS resistance. All mucronate amaranth populations exhibited a mutation previously documented to confer ALS resistance (S653N). No known resistance-conferring mutations were found in Palmer amaranth..